* The counting staff which were led by a Deputy Returning Officer for each constituency and the overall control was in the hands of the Acting Returning Officer, helped by the Electoral Registration Officers. * The candidates and the representatives of their parties to watch and ensure that all was carried out correctly. 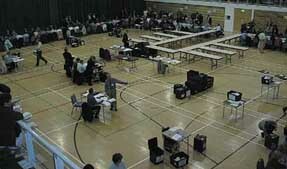 T owards the end of this process the candidates and their agents were called into the restricted area by the Deputy Returning Officers to look through the spoilt and doubtful papers to agree those OK to go forward. Voters must put an X against their candidate with no other marking. Those marked with a "tick" were accepted but any extra wording made them invalid. "Up the Mariners" for instance caused rejection!